Kansas lawmakers selected their leaders for next year with a new House speaker chosen by Republicans. 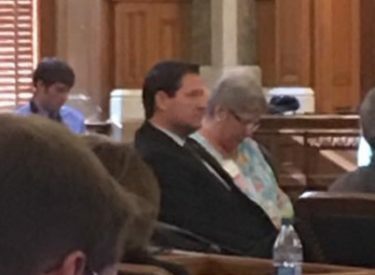 Rep. Ron Ryckman Jr. of Olathe, formerly of Meade was selected by the House to be the new Speaker. House Republicans designated a new speaker because incumbent Ray Merrick of Stilwell did not seek re-election to the Legislature this year. Also vying for the post was Majority Leader Jene Vickrey of Louisburg, and Rep. Russ Jennings of Lakin. Ryckman Jr. will serve a two-year term. Senate President Susan Wagle of Wichita was selected by fellow GOP senators for another four-year term as leader. Senate budget chairman Ty Masterson of Andover challenged her. Senate President: Senator Susan Wagle, R-Wichita, won re-election over Senator Ty Masterson, R-Andover. Senate Vice President: Senator Jeff Longbine, R-Emporia, won against Senator Gene Suellentrop, R-Wichita. Senate Majority Leader: Senator Jim Denning, R-Overland Park, who had no opposition. Senate Assistant Majority Leader: Senator Vicki Schmidt R- Topeka, won against Senator Julia Lynn, R-Olathe. The GOP Whip: Senator Elaine Bowers, R-Concordia, won against Senator Rick Billinger, R-Goodland. Senate Minority Leader: Senator Anthony Hensley, D-Topeka, was unopposed for his sixth term as Minority Leader. Senate Assistant Minority Leader: Senator Laura Kelly, D-Topeka. Minority Agenda Chair: Senator Marci Francisco, D-Lawrence, who had no opposition. Senate Minority Whip: Senator Oletha Faust-Goudeau, D-Wichita, who had no opposition. Caucus Chair: Senator Tom Hawk, D-Manhattan, maintained his position as Caucus Chair. Speaker of the House: Rep. Ron Ryckman Jr., R-Olathe, won against Rep. Russ Jennings, R-Lakin. House Majority Leader: Rep. Don Hineman, R-Dighton, won against Rep. John Barker, R-Abilene. House Speaker pro tem: Rep. Scott Schwab, R-Olathe, won against Rep. Ron Highland, R-Wamego, and Rep. Kyle Hoffman, R-Coldwater. House Assistant Majority Leader: Rep. Tom Phillips, R-Manhattan, won against Rep. Dan Hawkins, R-Wichita. House Majority Whip: Kent Thompson, R-Iola, won against Rep. Blake Carpenter, R-Derby. GOP Caucus Chair: Rep. Susan Concannon, R-Beloit, won against Rep. Willie Dove, R-Bonner Springs. House Minority Leader: Rep. Jim Ward, D-Wichita, won against Rep. Tom Burroughs, D-Kansas City. House Assistant Minority Leader: Rep. Stan Frownfelter, D-Kansas City won against Rep. Louis Ruiz, D-Kansas City, and Rep. Valdenia Winn, D-Kansas City. House Caucus Chair: Rep. Barbara Ballard, D-Lawrence, won re-election with no opposition. Policy Chair: Rep. Adam Lusker, D-Frontenac, had no opposition. House Agenda Chair of Democrat caucus: Rep. Brandon Whipple, D-Wichita, won re-election with no opposition. Caucus Whip: Rep. Ed Trimmer, D-Winfield, won over Rep. Jarrod Ousley, D-Merriam.